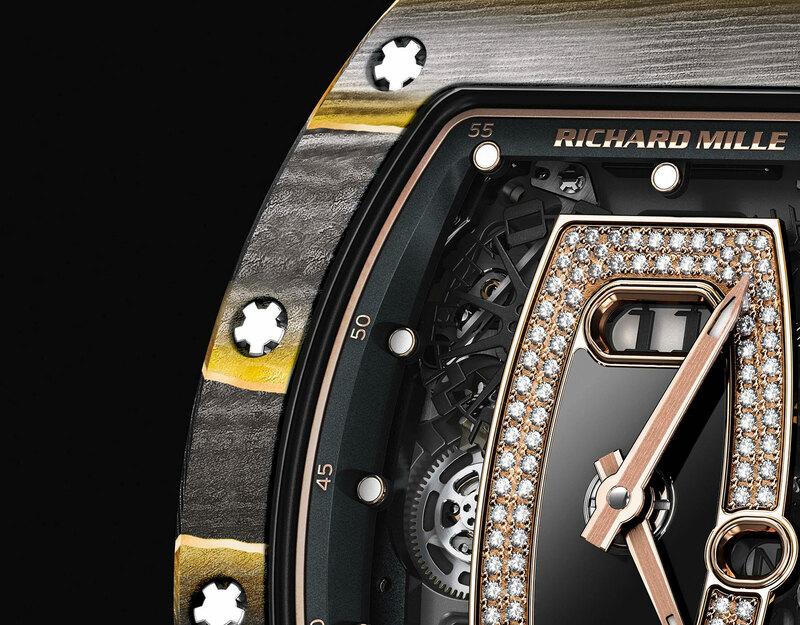 Having pioneered the use of North Thin Ply Technology (NTPT) carbon composites in watch cases, Richard Mille is once again injecting new elements into the distinctive striped material. Both Gold Quartz-TPT and Gold NTPT carbon have 10 micron-thick sheets of gold leaf in between the composite layers, giving the new materials brilliant gold striations. 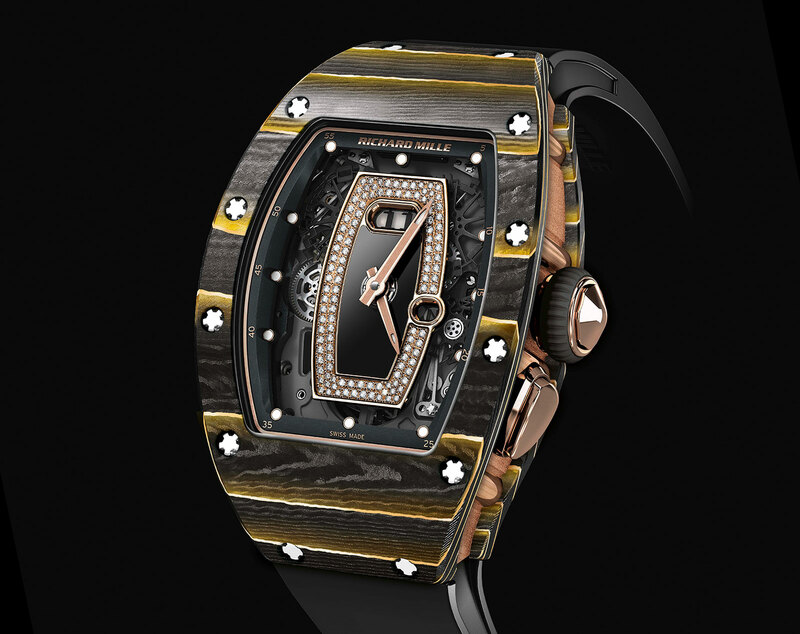 Made by Swiss specialist NTPT, the material Richard Mille usually employs for its composite watches consists of sheets of carbon fibre, one over the other, alternating the direction of the weave to create a striking pattern. Various iterations of the composite have been introduced since its inception, including a quartz-silica-carbon combination in flaming red, as well as a grey and white composite used on the ultra-light RM 27-02 Rafael Nadal. Both the RM 07-01 Gold Quartz-TPT and the RM 037 Gold NTPT Carbon feature red gold case bands, along with the hands, dial and crown in the same warm colour of gold. The RM 07-01 Gold Quartz-TPT has a mother of pearl dial centre, while the RM 037 Gold NTPT Carbon has it in polished black onyx. Both the RM 07 and RM 037 are both ladies watches with automatic movements, but the RM 037 is slightly larger with additional functions. 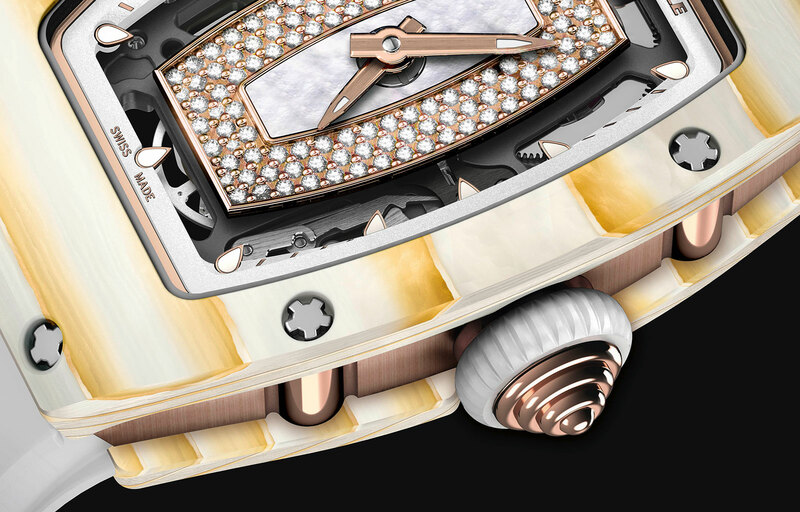 While the RM 07 tells only the time, the RM 037 also has a date function that can be set via the button at four o’clock. Pricing has yet to be announced, but with the white ceramic RM 07 priced at about US$100,000, expect this pair to cost substantially more.